Ex-England boss Hope Powell believes the appointment of Helena Costa as coach of a men's team could inspire other clubs to take on female managers. 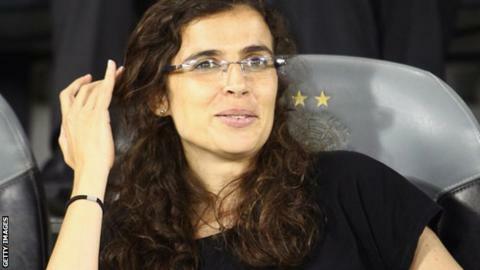 Portuguese Costa became the highest-placed coach in the European men's game when she took charge at French second division football side Clermont Foot. Powell, 47, told BBC Sport: "I'm sure it will happen again in the future. "We have to recognise the fact she has been given the opportunity based on her qualities and her expertise." Costa is the second high-profile European coach to take charge of men's team after Italian Carolina Morace managed Serie C1 team Viterbese for two matches in 1999. Former Millwall and England midfielder who earned 66 caps. Costa, 36, told the New York Times: "I hope this is only the first step. I opened a door and more women will walk through on my back. That's what I hope." Powell, who spent 15 years as England manager, said: "Let's just hope she gets the opportunity to do a good job. "We almost take it as a given that every week somebody is being sacked, but if she doesn't last, let's not look at her gender as a reason for not doing well." Both Powell and England Under-19 head coach Mo Marley, 47, have Uefa Pro Licence coaching badges, with Powell the first women to receive one. "In this country I think there are four women with Pro Licences," the former England midfielder said. "Qualifications don't lie do they? "The game has changed. There are more female coaches who are qualified, doing their A licence and Pro licence, so in terms of credentials there really isn't any difference." Powell said the question of what barriers were preventing the appointment of a female coach was "not for me". She added: "You really need to ask the decision-makers at the clubs. It's their choice, isn't it?" Powell was sacked by the Football Association after England crashed out of last summer's European Championship without winning a game. She was linked with taking over at Grimsby Town while in charge of the national team. At the time, she dismissed the speculation as "lies" but says she would still consider a job in the men's game, although she is happy working with Uefa and Fifa. "Do I have the qualifications to meet that job?" she said. "My answer would be 'yes'. "Would I take a job in the men's game? If the opportunity was right, of course I would."